1 Bedroom, Biennial Floating Use, Even Years, Platinum Season. 2 Bed/2 Bath with Lock-out feature. Annual floating use, platinum season. 1 Bedroom, 1 Bath, Biennial Floating Use, Odd Years. 2 Bedroom, 2 Bath with Lockout Feature. Biennial Floating Use, Odd Years, Platinum Season. 2 Bedroom, 2 Bath with Lockout Feature, Platinum Season, Biennial Odd Year Use. At the center of the world famous Las Vegas Strip, the Marriott's Grand Chateau sits, with action-packed excitement and energy surrounding it in every direction. A style all its own, bringing you back to an era of elegance and beauty from southern France. With entertainment all around you, you may want to enjoy the high-flying acrobatics of Cirque du Soleil, go and see the rare green sea turtles and the golden crocodiles at Mandalay Bay's Shark Reef, or visit the majestic Grand Canyon. If you prefer to take a cruise try dinner and dancing on the Lake Mead cruise at the Hoover Dam, or visit King Tut's tomb and museum at the Luxor, which also has the brightest beam of light in the world shining from the top, or just cross the street from the Marriott's Grand Chateau and spend the day at Planet Hollywood. If you like sports, then the Thomas and Mack center is where you want to go, with the UNLV men's basketball team housed there, and all kinds of UFC, Boxing, WWE, PRIDE, and many other events to choose from. Buy one of our Marriott’s Grand Chateau timeshares for sale and find yourself in the best location to enjoy everything Las Vegas has to offer! At the Marriott's Grand Chateau timeshares not only will you enjoy your outdoor surroundings, you will enjoy every amenity that Marriott has to offer. From the complimentary valet parking as soon as you arrive, to the deluxe guest, and 1-, 2-, and 3- bedroom villas that will accommodate up to 10 guests, you will be welcomed with quick, friendly, efficient, and helpful service. Master villas come with fully equipped kitchens; separate living/dining areas, washer/dryer, and most villas have 42-inch plasma TVs and DVD players. The master suite comes with a king-sized bed, and an oversized tub/shower with views of the Las Vegas strip. If you feel like relaxing at your Marriott's Grand Chateau timeshare resale, you can relax while sun-bathing on the rooftop and enjoying cocktails at the Skybar 38, or if you would like to enjoy some cardio and weight training in a comfortable atmosphere, you can visit the state-of-the-art fitness facilities. An avid golfer? The Marriott 's Grand Chateau also sits no more than 10 miles from three amazing golf courses to choose from. The Bali Hai golf club, which takes you from the excitement and noise of the casinos to the perfect golfer's course is just 2.3 miles away. The Royal Links golf course, which reminds you of the very reason all golfer's love the game, not to mention it was designed to mirror the best holes of the British open's rotation courses is a mere nine miles away. Last but certainly not least, Desert Pines golf club, which has been referred to as Las Vegas' top strategic course, bringing you back to the feel of the countryside, with mature pine tree lined fairways, and four lakes throughout is also approximately nine miles from your timeshare at the Marriott’s Grand Chateau. If your appetite grabs a hold of you and you are not sure what will hit the spot, Las Vegas does not disappoint. Hungry for American? Try Gallagher's Steakhouse for delicious dishes with steak, chops, fish and seafood. Want more of a rustic atmosphere? How about Michael Mina at the Bellagio for a taste of seafood from the 2005 Epicurean award winner for best seafood? If Mexican is what you want, look for Gonzalez y Gonzalez, a traditional New York style cafe with a Mexican twist, with an outdoor courtyard filled with lanterns, piñatas, and a tequila bar. Perhaps you have a taste for the exotic, then cross the street from the Marriott's Grand Chateau to Planet Hollywood and look inside for P.F. Chang's China Bistro for Mandarin style wok cooking. Try a famous Chang's lettuce wrap, or a vegetarian dish, maybe Vegetable Chow Fun with wide rice noodles. 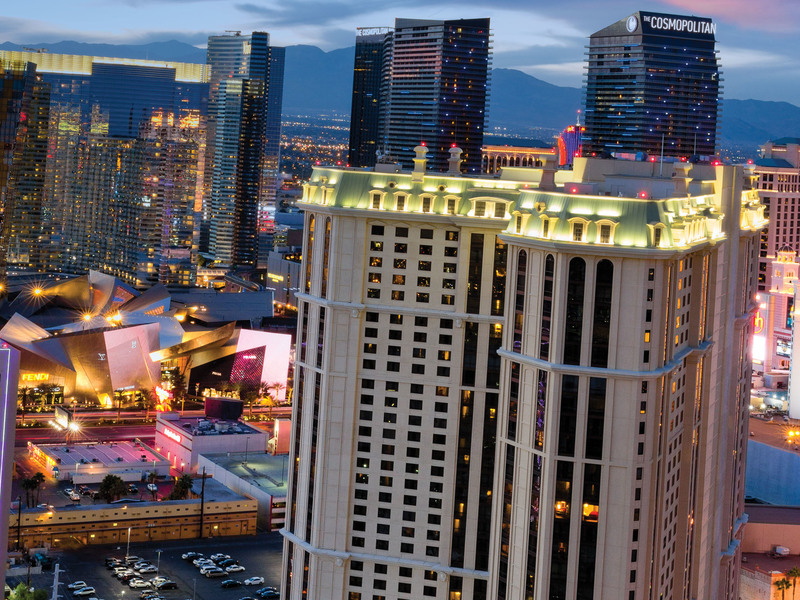 Day or night, Las Vegas lives up to its name as the entertainment capital of the world. If you want to bring your family for a fun-filled vacation, you have countless options. The Fall of Atlantis and Festival Fountain shows at Caesars Forum shops are filled with spectacular special effects, and lifelike animatronic figures to recount the myth of Atlantis at the free fountain show. After the show, take a walk behind the fountain and observe over 100 species of ocean life in a 50,000 gallon saltwater aquarium. If you love animals, check out Gregory Popovich's Comedy Pet Theater, with animal acts from jumping rope to barking out math problems and much more. Everyone loves the circus, so why not stop by the World's Largest Permanent Circus at the Circus-Circus Casino, with free shows open to the whole family. Watch death defying stunts every half hour between 11 a.m. and midnight. The acts include jugglers, unicyclists, trapeze artists, and acrobats. If you just need a night out alone without the kids, there are child care facilities that will watch your children for you, just ask the Grand Chateau concierge for the details. Business or pleasure, day or night, 365 days a year, staying in a timeshare at the Marriott's Grand Chateau is your only choice when making plans to visit the entertainment capital of the world, Las Vegas, Nevada. Premier Timeshare Resale is your only choice when you decide to buy a Marriott's Grand Chateau timeshare resale or sell your Marriott timeshare. Contact us to see available Marriott Grand Chateau timeshares for sale.